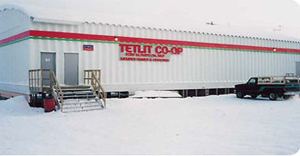 Incorporated in 1972, Tetlit Service Co-op operates a retail facility and hotel/restauran; this includes a conference and cultural centre that displays local artifacts and art. Other businesses operated by this Co-op include fuel delivery, a gas bar, cable television services, a post office and other local services. The traditional name is Teetl'it Zheh (Town at the head of the waters). Fort McPherson was established in 1852 when a Gwich'in village named Old Fort moved from six kilometres upriver to the present town site and is located on a triangular bluff overlooking the Peel River, at the southwestern edge of the Mackenzie Delta. In 1860, an Anglican mission was set up by Father Grollier, and in 1903 a Royal Canadian Mounted Police (RCMP) detachment was built. Traditionally, the Teetl'it Gwich'in people of the area moved between the Richardson Mountains and the river valleys according to seasonal hunting and fishing opportunities. They were known to visit the Hudson Bay trading post to exchange goods. Eventually, many settled in the community now known as Fort McPherson. Fort McPherson has a population of approximately 776. More than 80 percent of the population is of Gwich'in descent, making Fort McPherson the largest Gwich'in settlement in the Northwest Territories. The economy of the community is primarily based on hunting, trapping and oil exploration.